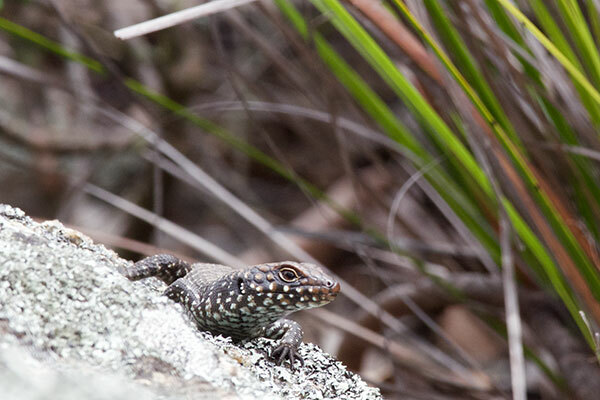 These very attractive skinks live in family groups on rocky outcrops, like some of the other Egernia species. They are extremely wary, and will dive into crevices at the first sign of a threat. 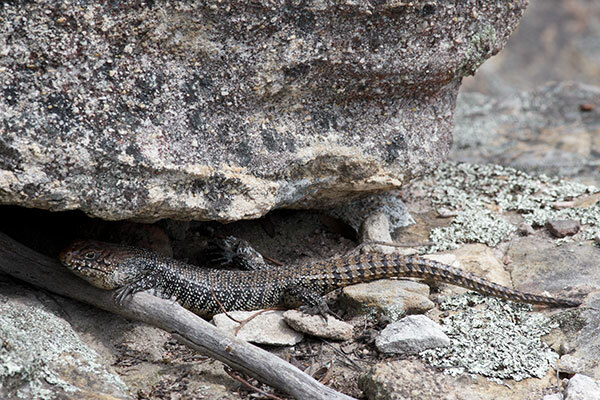 My friend David Fischer had led me to an outcrop where we saw a glimpse of skinky activity from some distance away. I attempted to sneak up on them by circling around a large boulder that would block their view of me, and discovered the large adult pictured at top behind that boulder. Fortunately for me, it sat still long enough for me to slowly position my tripod and camera and get some decent photos. When it finally slid under the rock, I continued around toward the rest of the skink family, but they were long gone by then. We continued on a short hike, and later returned to this spot where I managed to get a few longer-distance photos of younger skinks.